It affects each of us differently: that low-frequency, distant rumble in the sky. If you’re out exposed on a hill, it makes you look around to see whether you’re the highest thing in sight; time to move off the top. If you’re in a pool or a lake, it means get out. Or, if you’re a child that’s not yet come to terms with loud noises, you may cower under the covers. Of course, here on the West Coast, it also means it’s time to roll the news van. We don’t do lightning and thunder out here but a couple of times a year, and it makes headlines each time. That’s because we have cool, stable, relatively dry air coming in over a dry landscape during the summer, with only inland mountains occasionally providing enough lift to drive now-heated air up higher to release any moisture and breed the odd isolated thunderstorm. But further east, monster thunderstorms are standard fare – especially starting in Colorado, where dry westerly winds pour over the eastern front of the Rockies across the 100th meridian, the traditional divider between the humid east and the arid west, and into the vast stretch of North America lubricated by wet Gulf air masses. And where the dry meets the wet and the warm meets the cool – especially as the jet stream migrates north during the spring – exciting – and occasionally tragic – meteorological things happen. As dramatic and beautiful as lightning can be, it is, of course, dangerous, both to people and equipment. There is clearly no way of predicting where it will strike (OK, if your hair is standing on end, perhaps there is… too late…), so it’s best simply to clear out when it’s around. Depending on what you’re doing, however, you may need more or less time to do that – and if you’re inside busily working away, you may not even hear the rumble in the distance. So some way of predicting the approach of a thunderstorm would be useful. Mostly, we rely on human heuristics: 1 mile per 5 seconds delay between lightning and thunder or the 30-30 rule (less than 30 seconds delay means take shelter and wait until 30 minutes after the last thunder). Lightning detectors have been around for a while, but they’re on racks in buildings with big antennas; they may be useful for weather research, but they’re not usually employed as a tool for warning people about an approaching storm. And they detect only cloud-to-ground lightning, which is typically preceded by cloud-to-cloud lightning, which they don’t see. There are also other discrete detectors, but they’re still relatively bulky and are said to be beset by false alerts. Austria Microsystems (now going by AMS) has addressed this with one of the more single-purposed sensors around. And one that took a lot of research to perfect. 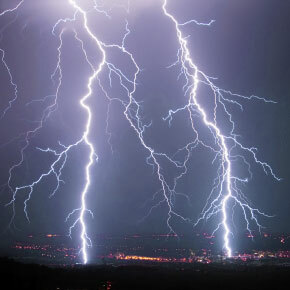 It’s a single-chip lightning detector that can recognize the unique electromagnetic pulse of both cloud-to-cloud and cloud-to-ground lightning. They were showing it off at the recent Sensors Expo. The algorithm itself is the thing they’ve had to work on for a long time. It’s not enough just to decide that lightning is present; they wanted to be able to track and report the distance from the approaching (or receding) storm, which they can do from up to 40 km away. And they needed to be able to discriminate lightning from other (mostly man-made) signals – and to report when the local noise is so “loud” that it’s drowning out any lightning signals. This algorithm listens for the signature that only lightning provides. In addition, while it doesn’t give an accurate count of individual strikes, it integrates the various strikes as part of its ability to determine the distance. All of this is stuff they don’t really talk much about because they’re still working on patenting it. But they are confident enough in it that the algorithm is hardened into silicon; they’re not running some sophisticated firmware program. So there’s no code patching if they want to tune the thing; they’re already done tuning. The implementation they were showing at Sensors Expo consisted of the detector chip itself, 6 caps, an inductor, and an antenna. There’s also a microcontroller (which they may integrate into the detector chip in the future). There’s a bit of FIFO memory on the detector chip; most of the rest of the used memory is in the microcontroller. This means that it’s small enough to fit in things like a hiker’s GPS unit. The chip itself draws about 60 µA, so it’s amenable to battery power (especially if implemented in a way that allowed you to turn it off when there truly was no chance of a thunderstorm). The obvious question, then, is, “Could it be put into a phone?” And the obvious answer is, “Yes.” But, for example, you couldn’t make the phone’s current antenna do double-duty, listening for lightning while it listens for your mother calling. The frequency range the lightning detector needs is around 500 kHz – far below what phones use. So integration with a phone would entail a second antenna – clearly a more serious consideration. That said, they claim to be in discussion with a phone company. In fact, this whole project originated based on an inquiry by a phone company. So whether or whenever it happens, people are clearly thinking along those lines. So with something small like this at the ready, teachers and camp counselors should have plenty of time to get a gaggle of unruly kids out of harm’s way. Hikers can have time to find the best place to avoid being the center of attention. Golfers can suspend their games (unless you’re Lee Trevino, in which case it doesn’t matter because you’re gonna get hit anyway… or Chuck Norris, in which case it won’t hurt you if you do). Uninterruptible power systems can bring delicate equipment down gracefully and isolate themselves from the grid. And for the writer or programmer or web developer who has his or her head stuck in The Zone, oblivious to the rain slapping on the roof and the howling wind and the cow flying by the window, there can be an alert that says, “Time to return to Earth, save and back up your work, turn off and unplug the machine, grab a cuppa Joe, and watch wide-eyed out the window as all Hell breaks loose.” It’s a pretty grand show. AMS appears to have done a lot of dedicated work hardening their algorithm here. What do you think? Smart? Not flexible enough?